We're including a helpful new control in the upcoming 2014.1 version of our WinRT/XAML Controls: The AppBarHint control. What is an App Bar Hint? Just dock the AppBarHint at the bottom of the page, set a background, and that's all there is to it. The control automatically opens the app bars when it is tapped. AppBarHint is also a ContentControl so that custom content can be inserted to the left of the ellipses if desired. We already use the AppBarHint control in our free Code Writer app. You can see it here in the lower left. In this usage scenario, we insert the line/column information as content within the AppBarHint control. Then when the user taps anywhere inside of the green hint, the app bars display. 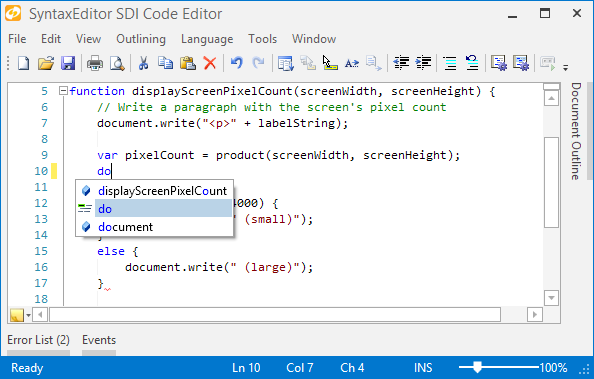 This new control will be available when the 2014.1 version of our WinRT/XAML Controls versions are released in March. In today's post I'd like to announce that we have added a simplistic completion provider to the language that should help end user coding productivity. One feature that several customers have asked for is the ability for SyntaxEditor to automatically resize itself based on its text contents. We didn't originally have this feature since it can be time-consuming (relatively speaking) and when editing huge documents, we didn't want to add any performance hits. That being said, in the upcoming 2014.1 version of SyntaxEditor for WPF, Silverlight, and WinRT/XAML, we have added a new SyntaxEditor.IsViewLineMeasureEnabled property that can be set to true to activate view line measure behavior. This means that you now can use SyntaxEditor in a layout scenario where its measured size will have an effect on its arranged size. You can see how this would be useful when SyntaxEditor is hosted in controls like a StackPanel. We've also enhanced our single-line edit mode with a neat new feature. Now if you set word wrap mode on and also have the view line measure features enabled, the single line will grow to render on multiple lines but will still not allow Enter to be pressed or inserted via pastes, etc. Even though the text is still a single line (no line feeds are allowed in single-line mode), the word wrap caused the editor to grow taller. These great new features will be available when the 2014.1 WPF, Silverlight, and WinRT/XAML versions are released in March. 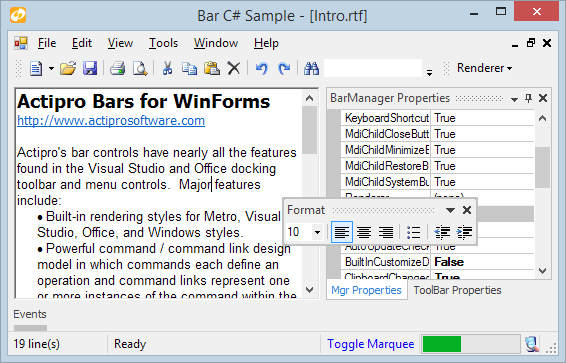 Yesterday we announced that a new Metro Light theme is coming to our WinForms Controls in the 2014.1 version. This new theme was modeled after Visual Studio 2013's appearance and helps give your app a sleeker look. In the newer Visual Studio versions, auto-hidden tool windows are represented by a UI element that no longer looks like a tab. Instead, the "tab" contains the tool window's name with a thick line underneath. Another change in Visual Studio is that hovering over the tab no longer automatically shows the tool window in a flyout. Users must now click to display the flyout. Our DockManager already has a AutoHideShowOnMouseHover property that can be set to false to achieve that sort of behavior. For the 2014.1 version, we have enhanced it further. If the property is false, and a tool window's auto-hide tab is clicked while the related tool window flyout is displayed, the flyout will now toggle closed. This achieves similar functionality to how Visual Studio 2013 works. These additions to give your WinForms app a fresh new Metro look will be available in the 2014.1 version of our WinForms Controls. We've had metro themes in our WPF control products for over a year now and recently announced that they are getting some very nice updates for their 2014.1, with a number of refinements and enhancements. Today I'd like to announce that a Metro Light theme is coming to our WinForms Controls as well! 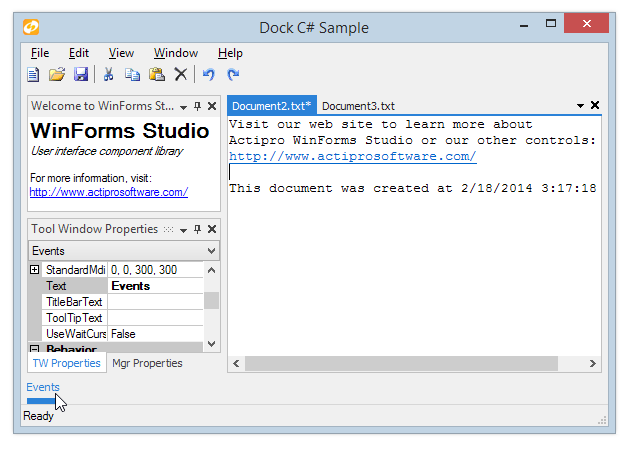 This new theme gives your WinForms apps a Visual Studio 2013-like appearance. First, we've added an additional option to the WindowsColorSchemeType that is called MetroLight and uses a flat color scheme similar to Visual Studio 2013's look. Next, we created brand new renderers for our Bars, Docking/MDI, and Navigation products that draw the controls using the Metro appearance. SyntaxEditor and Wizard already look good in Metro Light with their existing renderers. Notice how the entire window has a nice flat appearance and subtle touches like the dotted gripper title bars are included. This great theme addition to give your WinForms app a fresh new Metro look will be available in the 2014.1 version of our WinForms Controls.